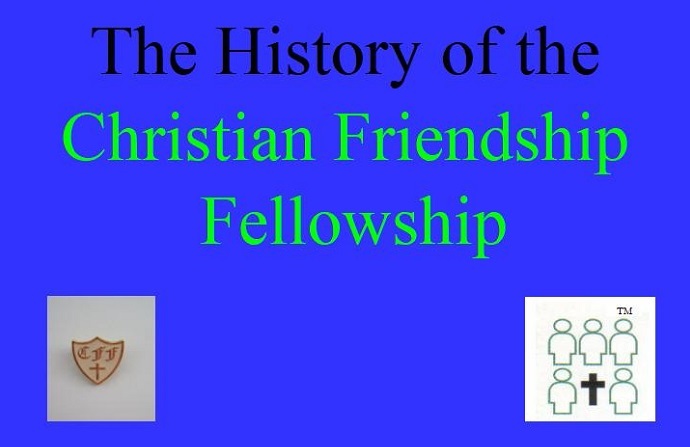 This is a slightly abridged version of the history of the Christian Friendship Fellowship which was given as a PowerPoint Presentation at the CFF’s 40th Anniversary Celebration at the Highbury Centre, London in August 2016. 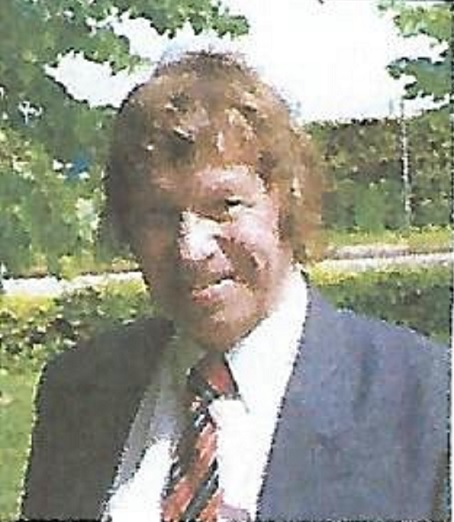 In 1976 Pastor David Lowe lived with his wife, Joy, and family near Doncaster. He was doing pastoral visiting, and put housebound ladies in touch with each other. Through this companionship he found that their lives were enriched, so he decided to start what he called the Christian Friendship Fellowship (CFF), on a basis of faith, to join lonely people together – and not just lonely ladies, but single men as well. This led to him putting an advert in the Christian press to start up a Christian marriage bureau, which people would pay to join. This he called, “Character Friendship Introductions” or CFI. At the end of the 1970s, a member in Lancashire, who was a coach driver, suggested having CFF coach holidays. David put the details in the very basic “News and Views” newsletter. 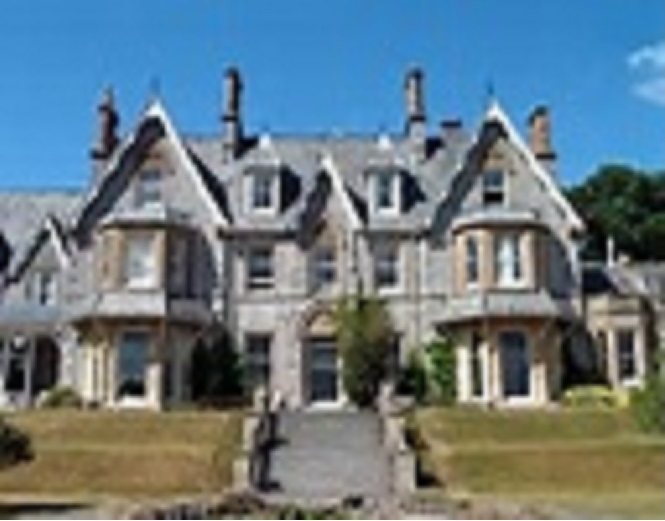 He said he had booked Brunel Manor in Cornwall for the exclusive use of CFF members. Over 100 people attended, and David Ormerod’s firm supplied 2 coaches, one travelling down the east coast and the other down the west, picking up those attending at strategic places en route. The holiday was a great success, and many friendships were made. Afterwards, Doreen from Cardiff asked David Lowe to send her the names of all the people in the Cardiff area who had been on the holiday, so they wouldn’t lose touch. This was the start of the first CFF group, which met in Doreen’s house in Cardiff. A chain reaction was produced, with people in other parts of the country wanting to keep meeting up with their CFF friends. 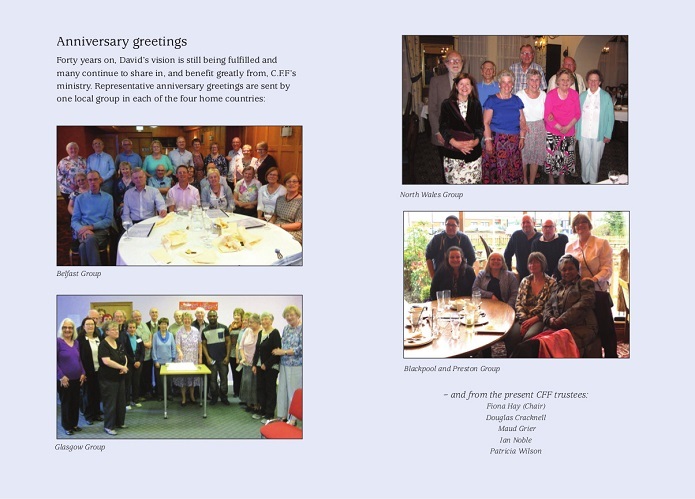 And so the CFF group system evolved, and – as far as we know – we are the only Christian singles’ organisation to have groups meeting in various parts of Britain and Ireland. Houseparties and holidays for single Christians continued to be organised for many years. 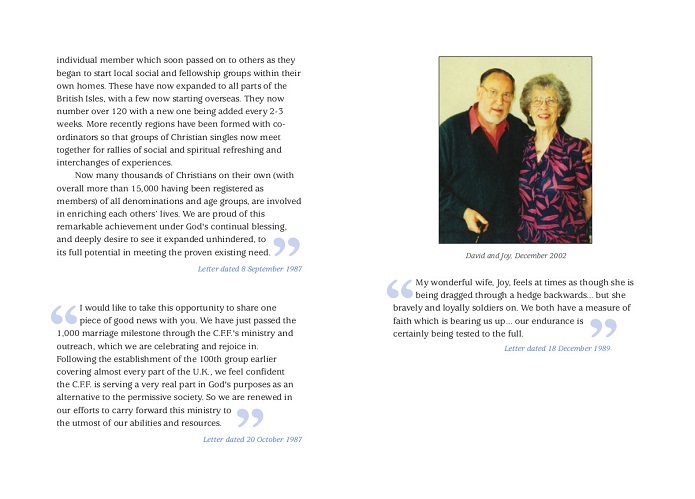 Some of the money which people paid to join Character Friendship Introductions was used by David to provide his living, but all the profits were ploughed back into the Christian Friendship Fellowship, which was a not-for-profit organisation. David’s wife, Joy, helped as much as she could, but as things took off more help was needed. David was a member of the Samaritans’ organisation at that time. When he was chatting to another counsellor – Brenda – between calls, he said that the secretary who had started working with him in CFF had left. Brenda lived just round the corner from him, and said she would help. She became his secretary, and as the business expanded she brought in her cousin, Ruth. Later Enid and Pam joined in and then finally Yvonne when Ruth gave up. By the end of the first 10 years, many local groups had been established, and 1000 marriages between members had taken place. Because the CFF was a not-for-profit organisation, David Lowe applied for charitable status for it, but kept getting turned down. Then he found that a former member who had met and married through CFF had written the definitive book on Charity Law, so he asked him to help. This resulted in the CFF becoming a registered charity on 3rd September 1988. When David Lowe retired, Bryan Conway became Chief Executive Officer of the CFF. The “Office Ladies” continued for many years with the CFF. 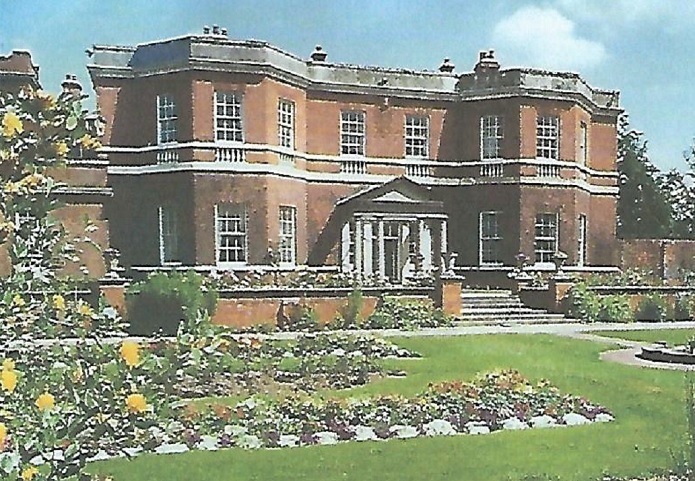 When it moved from Doncaster to 2 offices in Bawtry Hall, Bawtry, near Doncaster they ran the CFF and CFI from there, working on a part-time basis along with Bryan. 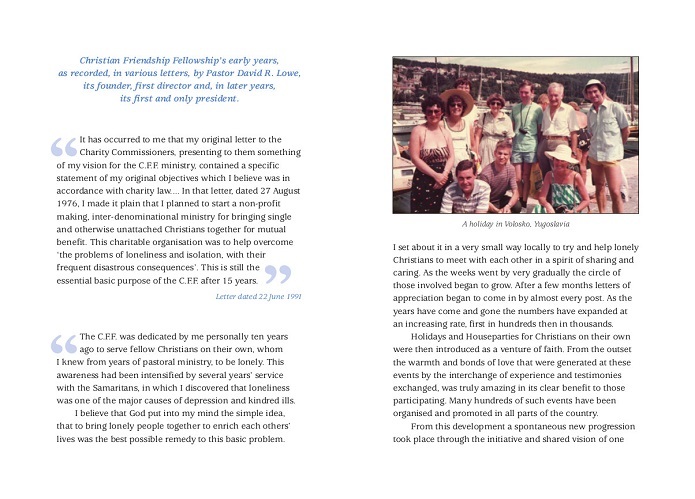 Later the organisation, which had been under the “umbrella” name of the Christian Friendship Fellowship, had to be reorganised and split into 3 separate entities - Character Friendship Introductions as set up originally by David Lowe to put people in touch with each other for penfriendship, companionship or marriage by means of “lists” sent out on a quarterly basis, Christian Friendship Fellowship the charity and CFF Holidays Ltd. Character Friendship Introductions and CFF Holidays Ltd were wound up at the end of 2009. 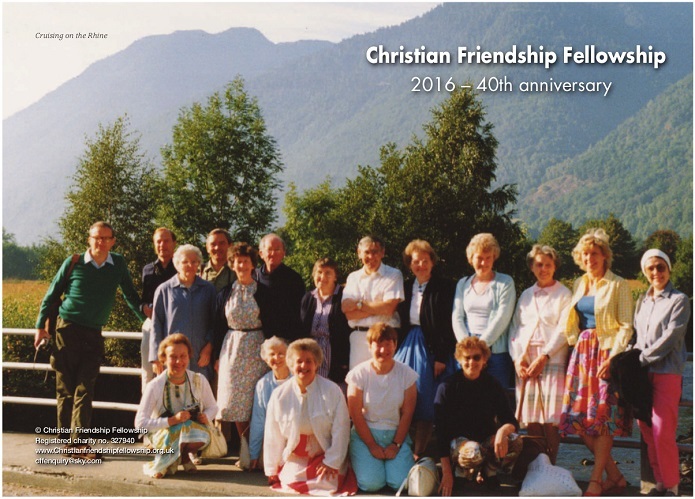 So only the Christian Friendship Fellowship now remains. When Bryan Conway gave up after 11 years as CEO of the CFF, Ben Da Costa took over for a year and was succeeded as CEO by Alison Richards. By the end of March 2010, the CFF gave up the lease of the offices in Bawtry Hall, and the CEO and “Office Ladies” moved on or retired. By now Fiona Hay was Chairman of the CFF Trustees, and she took over as Honorary CEO working from home in Glasgow, with a PO Box number created for CFF enquiries. The other Trustees are Douglas Cracknell, Ian Noble, Pat Wilson and Maud Grier. David Lowe died in February 2013, and his widow, Joy, died in March 2016. There are 24 local groups now, a few of which have people who have met and married through CFF, mostly in positions of leadership. These groups are spread over many parts of the British Isles, some larger, some smaller, and in a number of groups people tend to be in the middle-aged to older age bracket. Local groups arrange their own programmes and may include such things as meals out, rambles, Bible studies, meeting for coffee, visiting places of interest, quizzes, discussions, Praise and Worship times, Bring and Share Meals, games evenings etc. The activities are as varied as the members! Some groups meet weekly, others fortnightly or monthly. The London Meal is held once a month and people from the Greater London area (and sometimes beyond!) attend that. Many people have found abiding friendships through meeting others in the CFF, and some people even say that the CFF is “their family”! Certainly many can testify to the joy they have found in belonging to the Christian Friendship Fellowship, and to the enrichment of their lives through the activities and fellowship shared there.